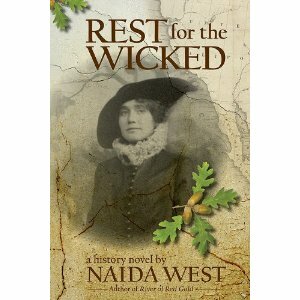 Rest for the Wicked is the 3rd book in a trilogy which takes place over a period of 17 years, from 1893-1910. The book is a history novel which I found to be interesting. I will apologize in advance for the fact that I have not read books 1 & 2, but I think each novel stands on it’s own as well as in a set. The main character is Mae Duffy who is 16 years old… she is a fictional character. She has moved with her family from Iowa to California in search of that instant wealth everyone was seeking at that time during the gold rush. One problem~ the gold rush is pretty much over and the economy has headed into trouble. Mae eventually leaves her family and ends up on an adventure where she finds out about how corrupt the government really is. Woman are thought of as not more than a “political tool” to get the men to the next level. She finds love with Billy McCoon who’s mother is “Indian Mary,” whom this trilogy is based on. I am not really up on my American history, but there are some historical figures in this novel that I recognized… I’ll let you figure them out for yourself. This book is definitely for history buffs, but the story is entertaining and it can appeal to anyone who enjoys the historical fiction genre. In this novel we find a love story, family drama, political corruption and we are given a great look into what it may have been like to live in that time period.